Senator Richard J. Gordon has accepted a donation from the Israeli Embassy and Pass It Forward to the Philippine Red Cross (PRC) of a mobile water purification system that the humanitarian organization could use to provide drinking water during disasters. "This would be very useful for the Philippine Red Cross in providing assistance during disasters because one of the interventions we provide is potable water. The GalMobile can be useful in natural disasters like floods, earthquakes, military use in difficult terrain and rural areas to provide drinkable water. It can deliver potable drinking water from any source, anytime, anywhere," said Gordon, who is also chairman of the PRC. 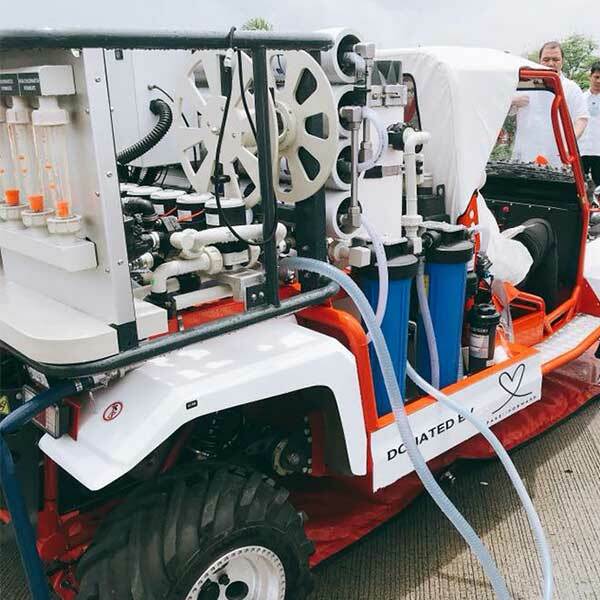 The first of its kind in water purification system, the GalMobile can purify up to 20,000 litres of sea water a day and 80,000 litres of brackish, muddy or contaminated river water and bring it to WHO standards. It is a "Unique independent, integrated Water purification system" and it caters to remote communities, villages at crises, and emergency situations in Israel. The jeep, which runs on a mere 12V low voltage system, is mobile, self-contained, independent and automatic. It contains an integrated water storage tank with a capacity of 265 Gallons to 2650 Gallons and can be deployed in less than 30 minutes by two people. Israel's technology is a source of envy for many world nations. Despite not having any groundwater and with a low average annual precipitation, the country not only meets its huge water consumption target but it also exports it to other countries. Israeli Ambassador to the Philippines Effie Ben Matityau and Pass It Forward CEO Shmuel Weiss turned over the donation. The ceremony was followed by a demonstration of how the GalMobile works using water from the nearby Libertad Channel. Gordon led guests and PRC officials in drinking water purified by GalMobile. Gordon has been an advocate for sustaining the robust bilateral ties and strategic relationship between Israel and the Philippines - filing a resolution recently to express the sense of the Senate to fully promote, support and enhance the Philippines-Israel relations by establishing a parliamentary friendship association between the two countries. Israel is a developed country, known for its high-technology designs and manufactures, and is considered as the start-up nation. Prime Minister Benjamin Netanyahu even announced that it aspires to be the world's fifteenth (15th) largest economy by 2025. Israel's diverse market economy which includes agricultural, service, tourism, high-technology, textiles, and diamond sectors will support the Philippines' fast-growing economy.